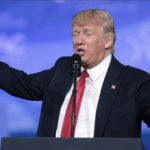 Right around 11pm eastern time, Donald Trump tweeted this quote: “We the people will now be subjected to the biggest display of modern day McCarthyism….which is the widest fishing net expedition….every aspect of the presidents life….all in order to get power back so they can institute Socialism.” Well, that was his second try. The first time around he typed “McCathyism” and it led to endless jokes about who “Cathy” might be. But the surreal part is where the quote came from.